1College of Resources and Environment, Southwest University, Chongqing, China. 2Vegetable and Flower Institute of Chongqing Academy of Agricultural Sciences, Chongqing, China. 3Institute of Agricultural Resource and Regional Planning, Chinese Academy of Agricultural Science, Beijing, China. has been established to simulate the dynamics of soil N mineralization under tobacco field conditions. A validation experiment showed that the measured values of mineralized N accumulation in the two experimental sites had a good correlation with the simulated values, indicating the practical value of the proposed model. Keywords: Flue-cured tobacco; temperature; soil moisture; modelling. Bijie City in Guizhou Province with an annual output of 6×107 kg of flue-cured tobacco, is China's third largest tobacco producing areas. In recent years, with the increase in cigarette sales, manufacturers have a higher demand for the quality of flue-cured tobacco leaf, especially in the nicotine content. The excessive supply of nitrogen in the late growth of flue-cured tobacco will not only cause the decline of maturity of flue-cured tobacco, but also make the nicotine content in tobacco leaves exceed the standard. The N requirement of flue-cured tobacco however, changed during different growth stages. Flue-cured tobacco demands a high soil N concentration in its early growth stages, but tends to exhaust the N supply after reaching full leaf area (usually a short time after topping) at its later growth stages to achieve maturity of different leaf positions at different times. There are two strategies available to meet the N demand pattern of flue-cured tobacco: first, choose light textured soils (such as sandy soil) which have a very low soil N mineralization capacity in the later growth stages. Second, avoid application of manure to decrease N release in the later growth stages (Chadwick et al. 2000). Either way, timely and precise estimation of soil N supply during tobacco growing season has a crucial role in the N management of high-quality flue-cured tobacco production. It is difficult to estimate the quantity and intensity of soil N supply, for the purpose of adequate application of fertilizer N. The soil N mineralization is affected by many environmental factors, including temperature, soil moisture content, bulk density, organic matter, and its microbial community. Through an experiment involving limited factors, a model of simulated soil N mineralization can be established to guide the management of flue-cured tobacco production and reduce the environmental risks caused by unreasonable N supply from the soil. Stanford and Smith found that potentially mineralizable N and N mineralization rate accords with the one-order kinetics reaction equation by long-term incubation of soil samples at 35°C and the correlation between model and experiment is good (Stanford and Smith 1972). As a result of this, a number of equations describing N mineralization processes have been proposed by different researchers. In addition, some studies suggest that N mineralization can also be fitted with parabolic equations (Broadbent 1986), linear equations, or hyperbolic equations (Juma et al. 1984). However, the parameters in these equations are obtained from laboratory incubation studies under optimal temperature (35 °C) and soil moisture conditions (usually field capacity), which could not represent soil N mineralization process under field conditions of frequent fluctuations in temperature and dry-wet cycles (Carpenter-Boggs et al. 2000). The strategy of in situ incubation under field conditions was to truly represent soil N mineralization dynamics (Raison et al. 1987). In view of the significant influence of soil N mineralization from environment, the factors of temperature and moisture content have also been applied in equation development, which are reflected by the potentially mineralizable N or mineralized N in situ. Wu et al. (2008) used the accumulated temperature in the one-order kinetic equation to fit the actual accumulated mineralized N content, indicating that it is possible to simulate soil N mineralization with field meteorological data. A polynomial expression: y = bx + (1 - b)x2 is established by Myers, which relates net N mineralization to available soil moisture between -0.03 and -4.0 MPa soil pore water potential (SPWP), fitted the data properly for nine Canadian soils in various experiments (Myers et al. 1982). There is an urgent need to understand dynamics of soil N mineralization under field conditions during the tobacco growing season. However, there are few studies on the dynamics of soil N mineralization in flue-cured tobacco fields. Therefore, any attempts to predict mineralized N in N recommendation systems could be helpful for the development of an improved and more accurate N management strategy in flue-cured tobacco production. The objectives of this research were to: (i) quantify the effects of soil moisture and temperature factors on the mineralized N (ii) establish a dynamic model of soil N mineralization in tobacco field by combining field and laboratory experiments and verify its validity. The study area (26。21’-27。46’N, 105。36’-106。43’E) is located in Bijie city, Guizhou Province, in the south-west of China. This area has a typical north sub-tropical humid monsoon climate with an annual mean temperature of 13.6°C; the highest and lowest temperature (31.2°C and -7.4°C) occur in July and January, respectively. Moreover, the annual mean precipitation is between 849 to 1399 mm. and annual sunshine incidence ranges from 1096 to 1769 hours (The data comes from Bijie Meteorological Bureau). The elevation difference in the region is large: vertical climate change is particularly evident. Soil types, properties, and environmental conditions are different at various altitudes in the city and need to be treated differently when studying soil mineralization dynamics. The soil samples used in this experiment were classified as yellow soil sampled from Qixingguan and purple soil sampled from Jinsha County according to the Chinese soil classification or Alumi-Ferric Alisols and Dystric Regosols according to the FAO classification. Organic matter, pH values, K+, HPO4 2-, NH4 +-N and NO3 --N contents are shown in Table 1. The experiment was divided into three parts: a field trial, an indoor temperature culture trial, and an indoor temperature-water interaction trial. The field experiment was carried out in Bijie City, Guizhou Province in China from April to September 2015. There were two sites used in the field experiment: one was in a medium-altitude tobacco growing area (elevation 800 m.) in Jinsha County, the other was in the high-altitude tobacco growing area (elevation 1500 m) in Qixinguan District. The laboratory cultivation experiment was carried out in Chongqing Academy of Agricultural Sciences, Chongqing City, China. Three replicates were established at each site. The soil samples were collected at 0, 1, 2, 3, 5, 7, 9, 11, 13, 15, and 17 weeks after flue-cured tobacco transplanting period (No crops were planted on the test ground), and the sampling interval was fixed at 7 days. Top soil samples (0-20 cm) were randomly collected from each tobacco field. After that, the three replicate samples were mixed together and transported to the laboratory at 4 °C in an ice cooler. The soils were sieved through a 2 mm. sieve to remove animal and plant residues, and coarse particles, and were subsequently divided into two sub-samples: (i) the first was extracted with 0.01 mol L-1 potassium chloride solution and the contents of NO3 --N and NH4 +-N were determined by continuous flow analyser (SEAL-AA3, Germany). Simultaneously, the soil moisture content, basic properties (Table 1), and daily mean temperature were also determined; (ii) the second was placed in a sealed bag. Choosing one of the three sampling sites, the sealed bag was buried in a 0-15 cm deep soil layer. Then, keeping the bag open to the outside air with a plastic hose, after one week of field culture, the bag was removed, and the contents of NO3 --N and NH4 +-N in the soil samples were determined. This experiment was carried out indoors under varying temperature and intermittent leaching by aerobic incubation method (Stanford and Smith 1972). We weighed 15 g (The soil samples were filtered through a 10-mesh sieve) of air-dried soil and the same amount of quartz sand, wetting and mixing them well with 3 ml of distilled water, and then transferred the sample into a 60 m plastic syringe (the bottom of plastic syringe was paved with glass beads and 20 g of quartz sand). A layer of glass fibre and 20 g of quartz sand covered the bottom layer of quartz sand. Leaching the soil with 100 ml of 0.01 mol L-1 calcium chloride solution four times, followed by the addition of 25 ml of N-free nutrient solution (mixed solution of 0.002 mol L-1 calcium sulphate dihydrate, 0.002 mol L-1 magnesium sulphate, 0.005 mol L-1 calcium dihydrogen phosphate, and 0.0025 mol L-1 potassium sulphate) to the plastic syringe, and plugging it with a rubber stopper allowed (for one hour) the removal of any excess nutrient solution by suction and the wrapping of the top of the plastic syringe with sealing film. To maintain good ventilation, the sealing film was pre-pricked to form three holes. The moisture content of the samples was measured by the gravimetric method during the incubation period. The soil samples from the two experimental sites were incubated for 18 weeks and the temperature was changed every two weeks. The temperatures used (in order) were: 10, 15, 20, 25, 30, 35, 30, 35, and 40 °C. The leaching solution from each soil sample was collected when the incubation temperature was changed and the contents of NO3 --N and NH4 +-N in the leaching solution were determined. In this experiment, nine soil moisture contents (0.1, 7%, 13%, 20%, 27%, 33%, 40%, 47%, and 53%) and seven temperatures (5, 15, 20, 25, 30, 35, and 40 °C) were used. We weighed 15 g of air-dried soil (The soil samples were filtered through a 10-mesh sieve) into a 50 ml beaker (nine replicates), and then added 0, 1, 2, 3, 4, 5, 6, 7, or 8 ml of distilled water to each sample, stirred them well and sealed their beakers with sealing film. Each sample was incubated for two weeks at each temperature in thermostat incubator. The leaching solution from the soil samples was collected in the same way as the previous trial and the contents of NO3 --N and NH4 +-N in the leaching solution were determined. The data in the tables and figures are expressed as the means of all replicates ± S.D. Data were statistically analysed by ANOVA using SAS Version 9.3 (Statistical Analysis System Institute Inc., Cary, NC, USA). The statistical significance between mean values was compared using Duncan’s multiple range test (P < 0.05). A non-linear regression analysis was implemented to determine model parameters. In the one-pool model (OPM) (Stanford and Smith 1972), N i s the cumulative mineralization (mg kg-1), N 0 the mineralization potential (mg kg-1), k1 is the first-order reaction rate, and t is the time elapsed (day). For the logistic curve (Cabrera 1993), N is the cumulative mineralization, and a and b are constants. In the effective accumulated temperature model (TAM) (Wu et al. 2008), T is the base temperature (℃), T 0 is the instantaneous temperature, and n is a model parameter. is the soil moisture, k is a constant, and n is a model parameter. In Figure 1A, the trend of soil N mineralization rates exhibited no significant difference across the two chosen sites. The mean mineralization rate of SI was 4.67 (mg kg-1·wk), and that of KI was 4.31 (mg kg-1·wk). The highest N mineralization rate of the two sites appeared at 35 °C, with SI at 8.27 (mg kg-1·wk) and KI at 6.44 (mg kg-1·wk), and the lowest was at 10 °C. With increasing temperature, the soil N mineralization rate at the two sites showed an upward trend; after reaching 30 °C, the rate was significantly reduced with decreasing temperature. The temperature change meant that the highest soil N mineralization rate of SI increased by 288.2% compared with the lowest, and that of KI increased by 246.2%. However, it is worth noting that soil N mineralization rates were different even at the same temperature but with different incubation periods, such as that at 30 °C (weeks 10 and 14), 25 °C (weeks 8 and 16). 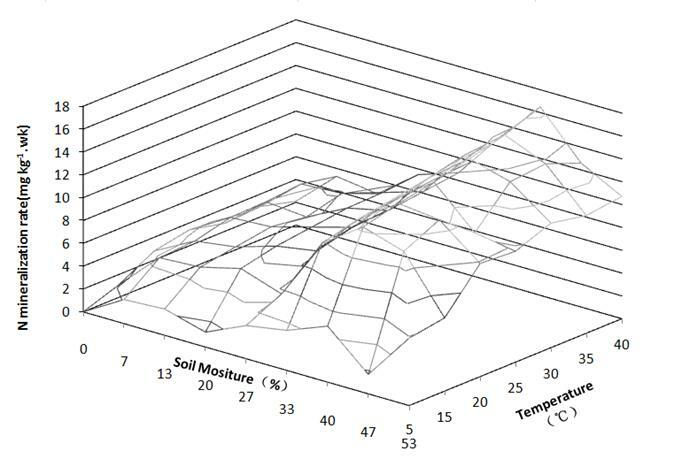 Figure 1: Dynamics of soil nitrogen mineralization at different temperatures. 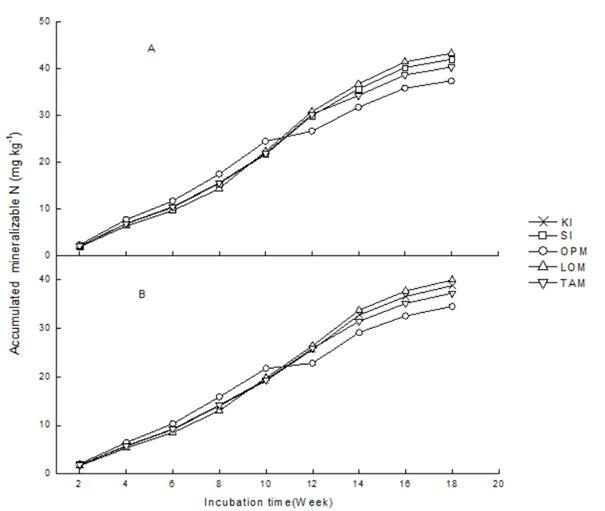 N mineralization rate under a variable temperature regime at both sites (A) and accumulated mineralizable N during the incubation period at both sites (B). SI represents the data in Qixingguan and KI represents that in Jinsha. In Figure 1B, the trend of soil mineralized N accumulation at both sites was similar. At week 2 to week 8, the mineralized N accumulation of SI and KI increased slowly, then increased rapidly over weeks 10 to 14, and plateaued after 14 weeks. The total mineralized N accumulation of SI (42.08 mg kg-1) was higher than that of KI (38.85 mg kg-1), which was higher than that of KI at all stages of culture: this gap gradually increased over time. The fitted results are shown in Figure 2 and Table 2; the model of effective accumulated temperature (TAM) has the best fitting effects for both experimental sites and the OPM was the worst. Therefore, it is better to describe the dynamic process of soil N mineralization under the influence of temperature with the effective accumulated temperature model given the scope of this experiment. Figure 2: Simulation of soil nitrogen mineralization and its accumulation. The fitted results of three models of SI (A) and those of the three models of KI. SI denotes the dynamics of N mineralization under a variable temperature regime in Qixingguan and KI denotes that undertaken in Jinsha. OPM is a one-pool model, LOM is a logistic curve model, and TAM is an effective accumulated model. SI, data in Qixingguan indoor trial; KI, represents data in Jinsha indoor trial; OPM, one pool model; TAM, model of accumulated temperature. Table 2: The fitting effects of each model under variable temperature regimes. The water effect equation was used to fit the culture experimental data and a regression analysis was performed. The results are shown in Figure 3, and the observed values are significantly correlated with the simulated values. Therefore, the improved water effect equation can be used to describe effect of water content on soil N mineralization with regard to the interaction of moisture and temperature. The effect of soil water content on soil N mineralization rate was non-linear (Figure 4). When the soil moisture content was less than 40%, the N mineralization rate increased with increasing soil moisture content, while upon exceeding 40%, the soil N mineralization rate decreased. The effect of temperature on the soil N mineralization rate was basically consistent with the variable temperature culture experiment. 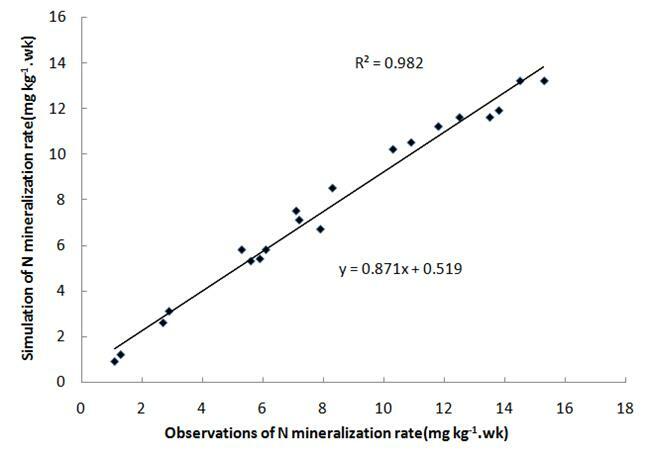 Figure 3: Regression analysis of nitrogen mineralization: simulated and actual values under different soil moisture. Figure 4: Simulation of soil nitrogen mineralized by the interaction between temperature and water. Where K, m, and n are constants; is the soil moisture content, is the soil moisture content at maximum N mineralization, T is the base temperature, and T 0 is the instantaneous temperature. 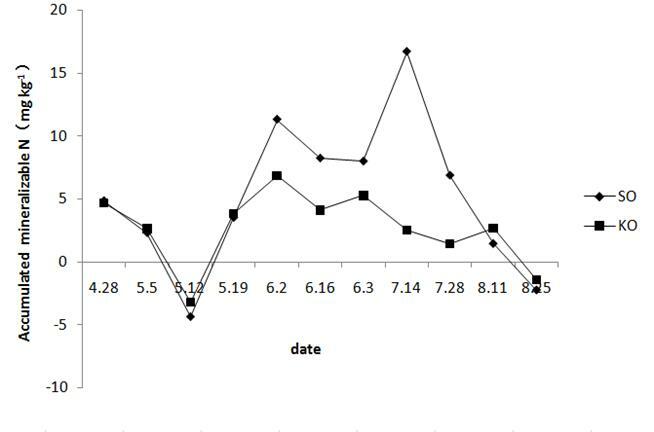 It can be seen from Table 3 that the temperature and soil moisture contents during field trials were constantly changing, so the soil N mineralization also changed (Figure 5). Soil N mineralization was very low at the end of April to early May, there was even a net N immobilisation in mid-May. After the beginning of June, the trend in soil N mineralization at both sites differed. Soil N mineralization of SO increased gradually, and reached its maximum in mid-July then rapidly fell to an immobilisation state. KO reached its maximum in early June and decreased to an immobilisation state thereafter. At the same time, it can be seen from Figure 5 that the net mineralized N accumulation of SO is higher than that of KO, which may be due to the differences in organic matter content in the two test sites. 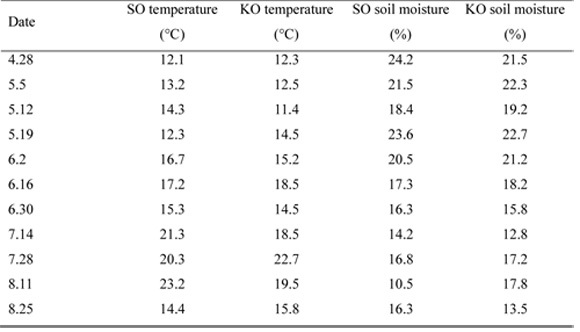 Table 3: Soil moisture content and daily mean temperature variation during tobacco growth. SO, Qixingguan field trial; KO, Jinsha field trial. Figure 5: Dynamics of soil nitrogen mineralization during tobacco growth. SO represents the observed data in Qixingguan field trial and KO represents that in Jinsha field trial. The data from field trials in Qixinguan and Jinsha were used to verify the fitting effect of Equation (5), and the results are shown in Figure 6, the measured values of mineralized N accumulation in the two experimental sites exhibit good correlation with the simulated values and regression analysis results were significantly correlated therewith. The S regression equation correlation coefficient was 0.987, the K regression equation correlation coefficient was 0.959, and the fitting effect was very good. It is worth noting that the correlation between simulated and measured values is not good when being used to describe the rate of soil N mineralization; because the soil N mineralization rate was negative in this field trial, but the fitting result of Equation (5) was always positive, it cannot reflect the net immobilisation effect of soil mineralized N.
Figure 6: Dynamic simulation of soil nitrogen mineralization in a tobacco field. By substituting the field trial data into Equation (5), the parameters therein may be determined. The value of θ Max derived from the results of the indoor temperature-moisture interaction trial was 40%. Comparing the data from the field culture experiment with those from the indoor culture experiment, it may be seen that, to reach the temperature of N net mineralization, the former required a higher temperature than latter. Through calculation, 13.2 °C was found to have been the base temperature at which the net mineralized N was generated, so T 0 was 13.2 °C and T was the daily average temperature during field culture. According to the fitted results of soil N mineralization in these tobacco fields (Figure 6), the values of m and n could be taken as 0.1 and 0.5, respectively. The N mineralization potential of tobacco soil was 130.6 mg kg-1, and the potential supply of N in the uppermost 20 cm of topsoil was 470.2 kg ha-1, which is five times the recommended amount N fertiliser for flue-cured tobacco planting in China (90 kg ha-1) (Liu et al. 2010). This indicates that the potential N supply capacity of tobacco-planting soil is large in Chinese main tobacco growing regions. The soil organic matter in the study area is high and there is a lot of rainfall in the later growth stage of flue - cured tobacco. This could not only lead to a lower quality of flue-cured tobacco, but mean a huge environmental risk by the NO3 --N leaching to groundwater. Therefore, predicting soil N mineralization processes by analysing the various influencing factors is important for tobacco fertilisation and planting division. Temperature can alter the activity, quantity, composition of soil microbial community, or the supply of substrates, thereby affecting N mineralization in the soil. There was a significant positive correlation between temperature and soil N mineralization in a certain temperature range, however, there are different views on the optimal temperature for mineralization. The effect of temperature on nitrification rate was greatest at 24 °C, moderate at 37 °C, and lowest at 18 °C (Thangarajan et al. 2015). Xu et al. (2014) suggested that rates of N mineralization and nitrification were insensitive to temperature at lower temperatures (0 °C and 5 °C) but increased at higher temperatures (15 °C and 25 °C). Sometimes, at extremely low temperatures, i.e., close to 0°C, in non-growing seasons, higher N mineralization rates might occur due to lower N immobilisation of microbes (Zhang et al. 2011). Some studies suggest that the soil N mineralization rate in the function of soil nitrogen mineralization and temperature should be constant (Sierra 1997), but others consider that soil N mineralization is nonlinearly related to temperature and should be described by an exponential function (Katterer et al. 1998). The results in this study showed that the soil N mineralization rate fluctuated with temperature at both sites which confirmed the latter's view. The highest N mineralization rate appeared at 35 °C and the lowest at 10 °C. (Sierra 2002) shows that greater diurnal temperature changes can have an effect on nitrogen mineralization, but in the case of small daily temperature differences, the daily average temperature can also be used for calculation of nitrogen mineralization. This paper applies the results of that study. The daily mean temperature was used as the field N mineralization simulation parameter. It is well known that mineralization is a process in which soil organic compounds are decomposed by microorganisms into inorganic compounds, and the decomposition activity of microorganisms is determined by the kinetic properties of several enzymes. Therefore, the dynamics of soil N mineralization follow a first order dynamic relationship (Stanford and Smith 1972). It is feasible to use the exponential model to describe the mineralization process. Models and their corresponding parameters are essential to a mathematical description of soil N mineralization kinetics. The temperature has been widely used as an important parameter in models of N cycles to depict the responses of N mineralization with varying temperature. In many N mineralization simulation experiments however, the researchers keep the temperature constant during entire incubation period. 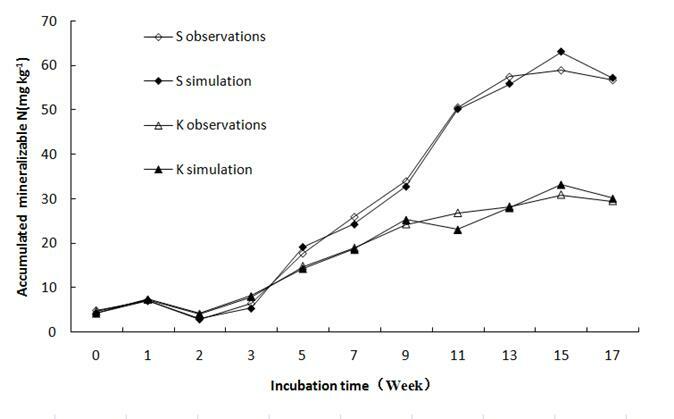 To describe the dynamic changes of N mineralization in the field environment, a variable temperature mode of culture was adopted in this incubation trail; because of the different effects of the variable and constant temperature incubation on N mineralization, not one, but three models were used in this study. All of the three models (OPM, LOM, and TAM) were used to calculate the trend of soil N mineralization in the soil during the crop growth period and because of the different prevailing environmental factors, the choice of model is usually based on the actual situation (Wu et al. 2008). By analysing the fitting results of the three models in this variable temperature culture experiment, it was found that TAM had the biggest R2 of all of the regression equations and the smallest residual at both trial sites, which meant that TAM was more suitable for describing soil N mineralization than the others under variable temperature conditions in a tobacco field. Although the parameters of the equation are slightly different, this finding was consistent with results of previous studies (Ma et al. 2011). Water availability effects soil microbial activity and thus the rates of N mineralization. In related studies, no matter in what form, or to what extent, there is always a soil moisture content at which the N mineralization rate may be maximised among all treatments (Hu et al. 2014). Soil nitrogen mineralization was significantly correlated with rainfall in field conditions and always higher in spring and autumn. This indicating that water availability was a major limiting factor in the process of microbial degradation. Soil N immobilization is more than nitrification when the soil moisture is saturation which leads soil N mineralization decreased (Marrs et al. 1991). Rewetting-drying process in soil will stimulate the vitality of soil microbes and increase the mineralization rate of soil N mineralization. As the controlling factors over soil microbial activity and community, most studies are concerned with the interaction of temperature and soil moisture on N mineralization, rather than individual soil moisture content readings (Jin et al. 2013). Usually, temperature and moisture could interactively affect net soil N transformation processes. In Li et al. (2014), increasing temperatures (and moisture contents) enhanced the sensitivity of N mineralization to moisture (and temperature). Wang et al. (2006) found no difference in N mineralization rates among three soil moisture content levels at low temperatures (-10, 0, and 5 °C), an increasing N mineralization rate with soil moisture at higher temperatures (15, 25, and 35 °C), and the greater enhancement in net N mineralization rate by increasing the temperature at higher (25 and 35%) rather than lower (15%) moisture contents. In this study, through the interaction significance test, it was found that the interaction between temperature and water on N mineralization was significant, which indicated that the effect of temperature and water on soil N mineralization rate was not a simple additive effect, but an interactive one. Both the effects of soil moisture and temperature on soil N mineralization rates were non-linear during the entire laboratory temperature-water interaction trial period. The maximum N mineralization rate occurred in soil at a moisture content of 40% and at a temperature of 35 °C. As in previous studies, within different temperature ranges, also differed slightly (Li et al. 2014). When the culture temperature in the trials was between 20 and 25 °C, was 40%; but when the temperature was between 5 and 15 °C, was 27%. For an accurate description of the interactive effects of temperature and moisture on N transformation processes in our study, a fitting equation had been established. Soil moisture also plays an important role in the decomposition activity of microorganisms and its influence must be taken into account when predicting soil N mineralization dynamics. The relationships between N mineralization and soil moisture for nine different soil types have been examined by (Stanford and Epstein 1974). They found that the maximum N mineralization rates occurred at soil matric potentials of between 0.3 and 0.1 MPa, depending on soil type, which corresponds to gravimetric moisture contents of between 10 and 35%. Greater rates of N mineralization were observed at gravimetric moisture contents of 25 and 35% than at 15% in Wang et al. (2006). In our study, the modified water effect equation was used to predict the dynamics of N mineralization in a temperature-water culture interaction trial. Fitting results of the equation showed that: firstly, soil N mineralization rate was affected by soil moisture in the form of a single peak curve with the apex at 40%, N mineralization rates increased with increasing soil moisture content when the soil moisture was less than, or equal to, 40% and decreased when it exceeded 40%. Second, the responses of soil moisture and temperature to N mineralization were non-linear, and the interaction between them was significant. Soil microbes play an important role in ecosystems and N cycling. They are involved in the decomposition of organic matter and the formation of humus and regulate the process of energy and nutrient cycling in the soil. The activity and quantity of soil microbes are directly related to the potential available N required for soil supply to plant growth. About 1-3% of the soil organic N is mineralized for plant absorption during the growth process of plants (Baum 1980). The microbial biomass is the living component of soil organic matter and it typically comprises 1-5% of total organic matter content. Because of its high turnover rate, microbial biomass N content can respond rapidly to changes in N fertilizer practice. Bonde et al. (1988) found that the mineralization constant (0.36-0.61 week-1) of soil microbial biomass N was similar to soil easily mineralizable N constant (0.45-0.56 week-1). He inferred that soil microbial biomass N is the principal part of soil easily mineralizable N. In contrast, some studies have shown that soil microbial biomass N accounts for only a small fraction of N mineralization and microbial activity is more indicative of N mineralization potential than microbial biomass N (Puri and Ashman 1998). The activity of soil microbes is also affected by the content of organic matter. When the organic fertilizer is applied, microbes could produce a fast immobilization of the organic fertilizer. Long-term application of organic fertilizer could increase soil microbial activity and soil mineralized N than the inorganic fertilizer. Application of exogenous organic substances can stimulate the activities of soil microbes, but the organic matter with higher C/N ratio will reduce soil N mineralization by the biological immobilization (Khan et al. 2007). The highest levels of monthly soil N availability were observed during the spring and autumn when the soil temperature and moisture were optimal for microbial activity (Ramirez et al. 2016). Application of N fertilizer can affect soil N mineralization dynamics. Loiseau and Soussana found that compared with no application of nitrogen fertilizer, the application of nitrogen fertilizer can significantly increase the soil N mineralization (Loiseau and Soussana 2000). Over a three years period on grassland fertilized with slurry and urea, soil N mineralization ranged between 314-420 and 320- 344 kg NH4 +-N ha-1 yr-1, respectively; while in soil without N fertilization between 154-218 kg NH4 +-N ha-1 yr-1 was mineralized (p<0.05) (Martinez-Lagos et al. 2015). However, combining fertilizer and organic residue inputs alter N transformations through an interactive effect of immobilizing fertilizer-N which decreased the mineral N pool (Gentile et al. 2008). Hayne pointed out that the net N mineralization rate enhances with the increase in nitrogen fertilizer application, but this phenomenon is only temporary (Haynes 1999). This study also demonstrate positive effects that a short-term (5 year) pasture can have on soil organic matter quantity and quality and its attendant benefits on soil N mineralization and soil structure. Farmyard manure application and returning leguminous crop residue to the field can increase the soil organic nitrogen mineralization and leaching risk (Kayser et al. 2010). Fertilization of mid-rotation in Pinus radiata plantations makes unexpected sustained growth responses for more than 6 years and volume gains of 25m3 ha-1 and 50 m3 ha-1 in sandy and granitic soil. The study also found that the N soil availability increased for more than 6 years after fertilization and was equivalent to N uptake in the granitic and sandy soil (Ramirez et al. 2016). Based on the results of a culture experiment, we used Equations (3) and (4 ) to develop a combined function (Equation 5 ) linking soil moisture content and temperature on N mineralization in a tobacco field. To verify the efficacy of the model and determine the parameters thereof, the data from field culture trials in Qixinguan and Jinsha were used. The measured values of mineralized N accumulation in the two experimental sites have a good correlation with the simulated values during the growing season and regression analysis results were significantly correlated. This indicated that the model provided by Equation (5) can predict the dynamics of N mineralization in such tobacco fields. Although there are some discrepancies in N mineralization between the model predictions and actual values, the model can estimate the amount of N mineralization in soil before tobacco planting, so it could effectively guide N fertiliser and planting plans. In this sense, the importance of the model predictions cannot be underestimated. In this study, the model assessment was conducted at only two sites and during one tobacco growing season. Recent studies (Santos et al. 2016) have shown that soil N mineralization has strong spatial variability, which may be caused by the available organic nitrogen pool and prevailing hydrothermal conditions. These are recommended as potentially fruitful avenues for future research. Laboratory and field experiments have been carried out at two sites to show that temperature and soil moisture significantly affected N mineralization in the soil in two tobacco fields. The soil N mineralization rate fluctuates with temperature and the highest N mineralization rate appeared at 35 °C and the lowest at 10 °C. The interaction between soil moisture and temperature and its effect on N mineralization was significant. When the culturing temperature in the trial was between 20 and 25 °C, θ Max was 40%; but when the temperature was between 5 and 15 °C θ Max was 27%. Based on the results of the culture experiment, the model provided by Equation (5) was established to simulate the dynamics of soil N mineralization under tobacco field conditions. The results of the field experiment show that the model provided a good fit with the measured values of mineralized N accumulation at the two experimental sites. By substituting the field trial data into Equation (5 ), the parameters therein can be determined. The value of θ Max is equal to 40%, T 0 is equal to 13.2 °C, and T is the daily average temperature. The values of m and n could be taken as 0.1 and 0.5, respectively. This work was supported by funding for Chongqingbasic research project (2012csts-jbky-00508). The author thanks the Chongqing Science and technology Commission for their financial support, and the Vegetable and Flower Institute of Chongqing Academy of Agricultural Sciences for the use of their laboratory facilities and assistance when conducting the experimental work.